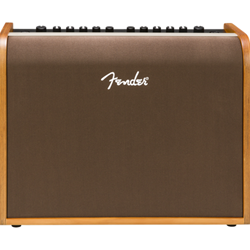 Fender’s Acoustic 100 amplifier delivers full, natural tone for acoustic-electric guitar and microphone. Its specially designed wood shell complements the acoustic guitar’s form and voice. The perfect portable system for solo performances, the Acoustic 100 amp has two channels designed for instrument or microphone use, each with studio-quality effects. Other convenient features include Bluetooth wireless streaming, an integrated handle, universal voltage for international use, and more.